There are only six hours left until the end of one most exciting tournaments in the crypto gambling community. BetChain, one of the best Bitcoin casino sites, features a weekly tournament called the Spin Fest. While playing their favorite games, online gambling fans have the opportunity to win fantastic prizes. To be more precise, every week players can win their share of a 10,000 EUR prize pool and 1,000 free spins. The rules of the tournament are simple. To start competing at the Spin Fest tournament, players should select one of their favorite games. The next step is to place a real money bet on these games. 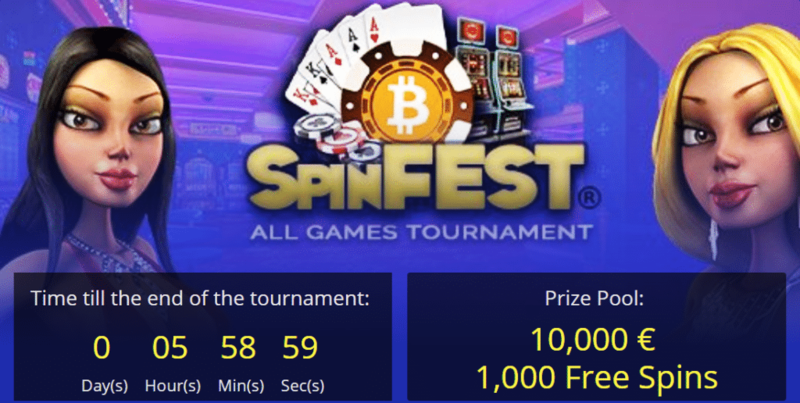 The complete list of games that are eligible for the tournament promotion is listed on BetChain’s Spin Fest page. The goal of the tournament is to have the wager of the highest value. Players who meet that goal can either win free spins or money prizes, and they have the entire week to do so. As a weekly tournament, the Spin Fest starts every week at the same time. The earliest players can enter the Spin Fest is on Saturday at 0:00 UTC. The tournament finishes on Friday at 23:59 UTC. The Terms and Conditions of the Spin Fest are also pretty straightforward. As long as you have a real account registered at BetChain, and you’re not wagering bonus money, you can compete at the tournament and claim prizes. One of the best things about the Spin Fest is that money prizes don’t have a wagering requirement. This means that players who finish the tournament in the first top 10 can withdraw their prize money without having to unlock them or anything similar to that. Now, let’s see what prizes BetChain prepared for their players. The first ten positions at the tourney bring money prizes that range from €50 to €5,000. So, first place wins €5,000, while players who finish second and third get €2,000 and €1,000 respectively. On the other hand, free spins go to players who rank on any position between 11 and 20. The highest number of free spins (200) goes to a player who ranks 11th in the tournament, while the 20th place gets 35. The BetChain team updates the results page on a daily basis and announces tournament winners on Mondays. If you decide to give the Spin Fest a try, we wish you the best of luck!